In view of the scale of its operations and the significant and growing number of incidents of so-called hate speech, the Open Dialog Foundation (ODF) is not able to comment on an ongoing basis on all allegations directed at it, in particular, criticism which is loosely based on fact, as expressed by anonymous authors. At the same time, the ODF takes legal action whenever it identifies and documents violations of its moral rights (e.g. against the publisher of the weekly ‘Wprost’). According to available information, the aforementioned study is likely to have a negative impact on the reputation of the ODF among its potential and important partners and lead to denials of co-operation in the implementation of grant projects; therefore, we would like to respond to it in a most comprehensive way. The study, cited below, contains anonymous allegations against the Foundation; each time, the accusations are presented in a red frame. Every allegation is followed by our official comment on the issues, raised therein. 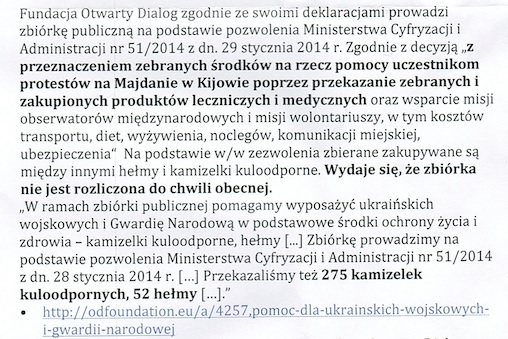 The aforementioned anonymous study which we received, was produced in the polish language. In this language version, the quotes in the red frames were also translated (for better understanding). The original study has been sent as an attachment. The Foundation was established in December 2009. In 2010, it was registered in the National Court Register. Since 2011, Ivan Sherstyuk has not been associated with the ODF or its activities in any way. Since then, neither the Management Board nor the ODF team have maintained any contacts with him. The ODF is not responsible for private actions and fate of their founders. We wish to emphasise that they have no connection with or any impact on the ODF. The President of the Board of the ODF, Lyudmyla Kozlovska, hasn’t been in any way connected with the ‘Dialog for Development" Foundation since 2009. Lyudmyla Kozlovska was not the organiser of the aforementioned observation mission in Georgia, and in 2008, she was focusing her efforts on the provision of humanitarian aid to Polish and Ukrainian victims of Russia’s aggression against Georgia. That year, as part of the activities of the aforementioned Foundation, Lyudmyla Kozlovska organised the International Forum on Human Rights in Central Asia (Warsaw, December 2008). The ODF, with respect for the applicable law, prepares and submits annual financial statements (Tax Office, KRS), as well as reports on activities (addressed to Poland’s Minister of Foreign Affairs). Wishing to further satisfy the principles of transparency (as well as the requirements resulting from the regulations of some grant competitions), on its website, it publishes both reports regarding the activities and financial issues, which are available at: http://en.odfoundation.eu/ (the page contains reports from the beginning of the ODF’s activities). In connection with the specifics of its activities, the ODF also conducts additional reporting in relation to the funding obtained from public collections and allocated mainly for the financing of humanitarian aid: http://en.odfoundation.eu/a/5948,an-annual-summary-of-the-activities-of-the-open-dialog-foundation-for-ukraine, and presented the results of such collections regularly at press conferences. As we have repeatedly pointed out, the ODF is financed from all kinds of donations and grants coming from individuals, companies and institutions, both Polish and foreign. The ODF does not comment on the facts of private life and does not speculate on the sound of names, or countries, or places of origin of individual donors. It should be emphasised that in many cases, digging into these issues is not advisable for safety reasons related to the aforementioned people, and often, it is also virtually impossible for practical reasons (for example, more than 2,000 donors in 2014; the inability to identify the identity of all donors, who put their money into collection tins). The Foundation has no knowledge of any kind of ‘external pressure’ (mentioned in the said study) or facts of the alleged lack of knowledge of “one of the members of the Foundation” with regard to the sources of financing of the ODF. It should be stressed, however, that financial and substantive reports of the ODF are approved by means of resolutions, adopted at the Board’s meetings by its members. We would also like to mention that in connection with the conducted activity (and the interest that it arouses), we have been subjected to numerous inspections by competent institutions. We presume, therefore, that the aforementioned authorities ruled out the possibility of the ODF having any dangerous connections (intelligence-related, threat to Poland’s state security, safety, public order?) which the author of the study alludes to numerous times. According to the information available via the ODF’s websites and in its reports, the Visegrad Fund financed the organisation of the aforementioned project in 2012. Subsequently, the project implementation was fully approved by the donor. We do not understand exactly what the argument, given by the author, is intended to prove. Detailed explanations regarding the conducted public fundraisers are available on ODF’s websites, and the online portal devoted to public collections, run by the Interior Ministry. Hence, the allegation regarding the failure to settle the fundraiser is not true. It is not true. The ODF has never attacked the Basilian Fathers. We value their activity, although we do not have contact with them on a daily basis as we do not have any reason for doing so. As indicated earlier, the ODF does not comment on the private lives of their donors. We also recommend that the sources of information listed above and, in particular, the official and quasi-official registers concerning the situation in Sevastopol and the Crimea, temporarily occupied by the Russian Federation, be taken with a pinch of salt. The ODF, indeed, for a short period, organised support for the aforementioned family. The public fundraiser was not officially announced, but this was due to changes in regulations, which currently do not consider an action carried out via Internet (with the use of social media) ‘a public fundraiser’; it only allows collections which are carried out through traditional means, where the money is collected in cash in public spaces (usually in line with WOŚP actions - volunteers, equipped with collection tins, standing on the streets). The author of these words was a journalist of Gazeta Wyborcza, and the aforementioned information (which is, indeed, imprecise) came from her. The ODF does not claim to be a partner of the entire, complex structure of the Ukrainian Caritias(es); still, it supports the work of the Caritas of Sambir-Drohobych Diocese of Ukrainian Greek-Catholic Church in Drohobych (which has been widely announced by us in our reports), which is headed by Father Artur Deska. The whole situation was previously time widely discussed with representatives of all interested parties (the daily GW, Drohobycz Caritas, the ODF, ‘friends of the ODF’) in social media. I’m asking Kamila who Putin is – “He came and took Crimea” - explains the 5-year-old girl. – “I would like to live in Crimea, I would like to go back there”, - she adds. Dilara looks at her daughter and comforts her: “We will return to Crimea. This is our fatherland and our home”. One of the partners of the Ukrainian Caritas in Poland is the Open Dialog Foundation. In order to help, you are welcome to transfer donations to the following bank account: Open Dialog Foundation, PL56 2490 0005 0000 4600 5911 3255 Alior Bank SAKod BIC-SWIFT ALBPPLW. When transferring funds from Polish bank accounts, please use the account number 56 2490 0005 0000 4600 5911 3255 (enter the description: “for Crimean Tatars”). We would like to emphasise that our influence on the interpretation of certain facts and circumstances (often simplified by the natural course of things) by the media, is limited. The ODF is an apolitical non-governmental organisation. However, we cooperate with politicians from different countries and different groups in order to defend human rights and achieve other goals as set out in our statute. Occasionally, the ODF also meets with politicians who have a negative attitude towards the aforementioned matters in order to influence them (e.g. through confrontation with documented incidents of human rights violations, as well as with victims of persecution). At that time, politicians from the ‘Five Star Movement’ party opposed the dictatorship of President of Kazakhstan, N. Nazarbayev and demanded the return of A. Shalabayeva to Europe. The ODF ceased its cooperation with representatives of the aforementioned group following the events of 2013. The ODF, as evidenced in our activities, consistently opposes the dictatorship of V. Putin, in particular, the aggression against Ukraine and the occupation of Crimea (which took place in the spring of 2014). We cannot be held responsible for the evolution of views or actions contrary to our beliefs, expressed or undertaken by independent persons or institutions — even if we have previously cooperated with such groups in certain areas. The aforementioned meeting, held at our ‘Ukrainian World’ centre in Warsaw, was carried out in line with the same principle. The aim of the meeting was to reach the huge number of Ukrainian citizens living in Poland. The second target group was Polish journalists interested in Ukrainian matters. The meeting was organised on the initiative and at the request of the District Electoral Commission at the Ukrainian Embassy in Poland. The ODF, at the request of the then head of the Consular Department, as well as the acting ambassador, supported the process of organising the presidential and parliamentary elections in 2014 (mainly by sharing space for informational meetings regarding the principles of registration and the voting procedure for citizens of Ukraine). The aforementioned meeting was part of this process. The ‘wave of anti-Ukrainian comments’ in question, arising after the event, was limited to the most radical, anti-Ukrainian circles of the extreme right and left wings. To the best of our knowledge, a significant element of the entities transferring humanitarian aid (including helmets and bulletproof vests) to Ukraine in 2014 did so in violation of the law (unaware of its existence) or by exploiting loopholes in the law (the so-called ‘ant smuggling’ method: declaring one item per volunteer for ‘personal protection’). The complexity and ambiguity of applicable regulations as regards this matter should also be highlighted. However, it should also be noted that such activities were arranged based on full conviction of acting in the so-called ‘state of necessity’, under circumstances of sanguinary street battles during the last days of the Revolution of Dignity, and later — in response to the outbreak of Russian aggression in Crimea and Donbas (the so-called ‘hybrid warfare’). Under these circumstances, it was necessary to act rapidly and with determination, and the purpose of such actions was to protect human life and health. It must also be added that, in addition to the support given directly to members of Self-Defence of the Maidan and soldiers from volunteer battalions in Ukraine, the ODF was obliged to, and attempted to ensure the protection of its coordinators and volunteers (observers and correspondents), who worked under dangerous conditions during the protests at the Maidan and at the time of Russia’s actions in Crimea and Donbas. They needed helmets and bulletproof vests as well. In addition, Polish media reporters who visited Ukraine have also repeatedly benefitted from the ODF's support in this area. Since March 2014, the Foundation has encountered serious legal problems related to the logistics of humanitarian aid. The volunteers and employees of the Foundation participated in several penal and penal-fiscal proceedings related to alleged unauthorised trading of helmets and bulletproof vests upon their unsuccessful transportation from Poland to Ukraine, which ended in their seizure by Polish border and customs services. Eventually, under the pressure of public opinion, the aforementioned proceedings were discontinued, and the lawyers of the Foundation were able to use their experience in order to help other organisations and volunteer groups in tackling similar problems. As a result of lobbying activities initiated by the Foundation, we managed to amend (liberalise) the provisions of the Regulation of the Minister of Economy of 8 May 2014, regarding the list of weapons, which can only be traded by licensed entities (Journal of Laws 2014.627). The amendment of 12 August 2014 (Journal of Laws of 2014, item 1113) included a number of bulletproof vests and helmets for personal use, which can be held and transported across the border without permission. Due to the need for further delivery of goods (such as specialist protective equipment — helmets and bulletproof vests) subject to licensed trading, on 15 December 2014, the Foundation obtained a license from the Minister of Internal Affairs No. B-088/2014. This license allowed us to perform business activities related to the trading of certain products designed for military or police use. In order to do this, we first had to pass the verification process that required, amongst other requirements, to obtain clearance from the Police, Internal Security Agency and the Military Counterintelligence Service. (section 2.2 Implementation of objectives in 2014 – Humanitarian aid). In our opinion, the intentions attributed to the ODF, demonstrate exceptional malice of the author of the study and are in conflict with one of the main objectives of our activity, i.e. Polish-Ukrainian cooperation. For the aforementioned activities, the Foundation gained the support, among others, of the Ukrainian Ministry of Internal Affairs, the Security Council and National Defence of Ukraine, the Embassy of Ukraine in the Republic of Poland and a large number of Polish and Ukrainian parliamentarians. In our opinion, the article of the ‘Tygodnik Powszechny’ magazine is relatively objective. We would like to allow readers to form their own opinions on the issues raised in it. The ‘Wprost’ magazine article violated our personal rights and, as such, is currently the subject of legal proceedings initiated based on our legal action (in particular, as regards our unfulfilled requests that the article be corrected and compensation for the damage caused be paid). In recent weeks, the case has been directed for mediation by the court and is currently in its initial stages. the aforementioned article by the ‘Wprost’ magazine, as well as the entire study (to which we respond in this document) serve to remind us of the deliberate attacks, aimed at discrediting the activity of the ODF and impeding our ability to act.